Here's a rumor which I don't find plausible but is still too juicy to ignore. Shares of E Ink Holdings Co yesterday rallied to an almost four-year high on speculation that Apple Inc might introduce a dual screen in its next iPhone model using E Ink’s energy-efficient e-paper displays. The stock price of E Ink surged 3.62 percent to NT$24.35 yesterday, retreating from an early gain of 5.53 percent. The closing price was the highest since Nov. 2, 2012. Turnover was the largest in a month at 34.74 million shares. The rally in E Ink’s stock price was prompted by a report by the Economic Daily News that Apple has requested E Ink to send products for sampling and certification after Yota Devices’ dual-screen YotaPhone 2 impressed the US consumer electronics giant. “We are aggressively exploring business opportunities to use our e-paper displays as secondary screens on mobile phones,” an E Ink public relations official said by telephone yesterday. The official declined to comment on information on any single customer. As per Apple's usual pattern, they would be launching a product which had been tried before, with little success. There are a number of products which add this type of functionality to an iPhone, and several dual-screen Android smartphones have hit the market. 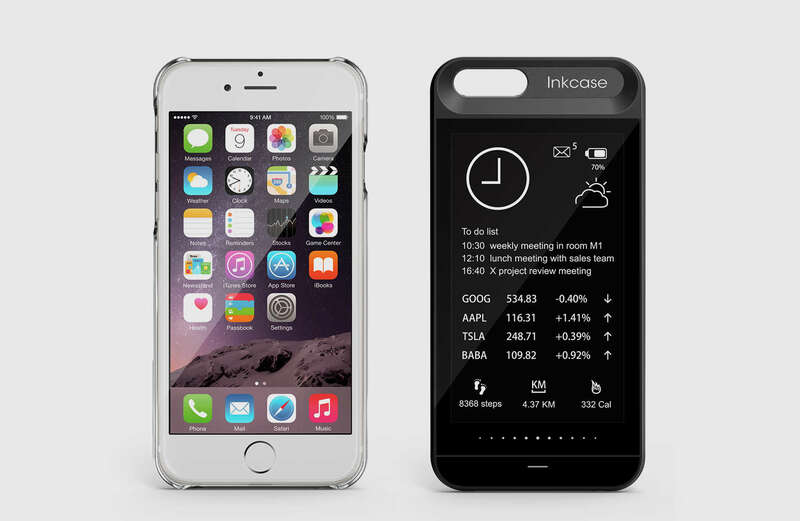 Popslate and InkCase, for example, have released cases which add an E-ink screen to the rear of the iPhone. Yota Devices has released two smartphones, and so have several Chinese smartphone makers. And E-ink is working on just the kind of solution Apple would want (and so is Microsoft). None of those products worked very well or had much commercial success, but Apple has in the past shown that they can copy an idea, improve it, and make it work for the first time. But as much as I would like this rumor to be true, I suggest that you take it with a grain of salt. The original source, Economic Daily News, is so unreliable that I usually assume any of its rumors are false. In my experience they're the Daily Mail of Taiwan tech news, second only to Digitimes in their willingness to publish any juicy rumor. And even if this rumor is true, I would remind you that there is a huge difference between asking for specs and technical info and producing a device. Requesting technical info (assuming it really happened) merely tells us that Apple is experimenting with the idea in their R&D labs. We won't know that Apple plans to follow through and actually make a dual-screen smartphone until the components, diagrams, blueprints, or other details start leaking at the factory. So until that happens, I would not get your hopes up. I wouldn’t be surprised if E-ink put that rumor out there themselves. They are so slow at making advancements that I find it hard to believe Apple would use them unless they planned to snap the company up. E-ink needs color to be fully relevant again. Its been 9 years since Original Kindle came out, even longer (2004) since Sony’s reader came out. 12 years and we still don’t have color. Well not color anyone really wants to use on their displays anyway. I just don’t see this rumor happening. I am constantly amazed that no one has bought E-ink. Judging by its revenues, the company could be bought for under a billion dollars. That’s petty change for Amazon, Apple, or Samsung. Yeah, I don’t buy this rumor at all. A company that has never made a product using e-ink is going to start with a dual-screen phone? Besides, Apple goes out of its way to avoid making multiple products in a given line. Otherwise, people wouldn’t be drilling holes into their iPhones to try to find the headphone jack. It’s not the craziest rumor ever. And it is certainly something I would expect Apple to test in a lab just to see if they can make it work. But yeah, it’s not very likely. Yea don’t get me wrong. I like e-ink but what have they been doing the last 12 years? Forget color, where is the 64 shades of gray? Ok I’m reaching, how about 32 shades? I’ve just seen bumps in resolution. I’m also in the mind set of watching tech turn fast. 12 years is a turtle crawl to me. I don’t know how big e-ink readers are to Amazon’s bottom line anymore. They use to push them pretty hard. I would bet the cheaper, do more, tablets out sell the e-ink readers now. I think its a small niche now that the newness has worn off coupled with a lack of advancements by E-ink. In the meanwhile, the sale of the Yotaphone 2.0 at the Gearbest was extended, they still have 200 phones left. At the moment you wrote your article last week they had 360 pieces. Not sure… E-ink on the back (of phones and tablets) is a great idea for improving sunlight visibility and saving battery at virtually no extra weight or thickness. I have a Yotaphone 2 and I absolutely love it. The tech would be much more prevalent if Amazon did not have a patent on it – which is why the Yotaphone never made it to the U.S. If anyone, Apple has the money to buy the patent from Amazon if they want. On the other hand, Apple tends to ignore useful trends for several years before taking them on board (cases in point: large-screen phones, stylus, water resistance…), so I don’t think they are ready for such a functional upgrade. They will just make an iphone out of ceramics, and call it a day. Interesting to ponder though.